Lots of dogs love water. It’s just a fact of life. And sometimes, or maybe all of the time, when I have clients with a furry friend, the dogs “opinions” are part of the equation when designing a new landscape for the whole family. There are many aspects of a landscape design to consider when creating a compatible situation for two species. 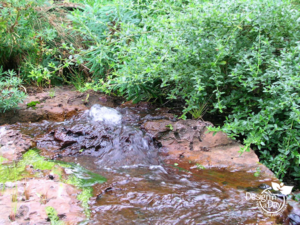 Water features are one aspect. People and dogs want to enjoy the water feature but they have different ideas about what is fun. 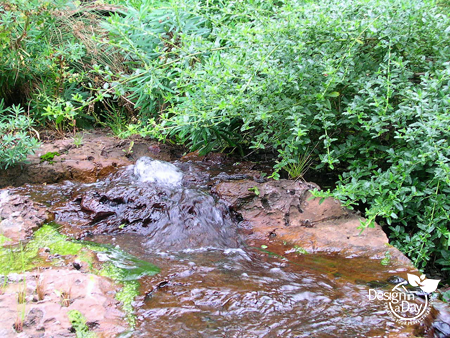 For people the sound of water can make a landscape feel like a garden and has a way of taking a space and turning it into a place. Dogs have different ideas. I started using echo chambers to create water features for my clients some 20 years ago when the echo chamber (designed by local Lew Smith) was a new thing. They were safe for kids and easier to care for but then I saw how much the dogs loved them and that if I planned well most dogs could interact with the echo chamber water feature without harming it or themselves. Take Jack Hofmann, a dog who knew a good thing when he saw it. I was hired to create a new entry design for a sweet old Portland craftsman home. Technically the water feature was designed and placed to enhance the new entry and to see it from inside the dining room. Now Jack is kind of a one person dog, so he never fawned over me, much as I would have liked that. He would remember me politely when I came to check on his guardians landscape but when the water feature was installed, he claimed it immediately as his own and posed for me. He knows where his new toy came from. I wasn’t the only one smitten by Jack’s photo. I was interviewed for an article in Houzz (check it out!) and his mug was featured in “Protecting Your Pet From Your Yard and Your Yard From Your Pet” a comprehensive article about dog friendly landscapes. Jack’s “water bowl” is pottery plumbed into an Echo Chamber, which is a steel box under the pottery. It creates an easy to care for water feature with great sound and because it has a dry return instead of a pond, it’s safer for kids. There is no pond to worry about or a liner you need to keep safe from dog claws. Read more about Echo Chambers in this blog post. 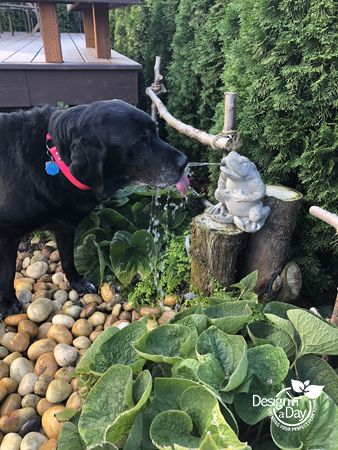 This black lab thinks the water feature was set up to quench her thirst. Some dogs specifically like to drink the water and make a game of it. Does your dog love it when you get out the garden hose? 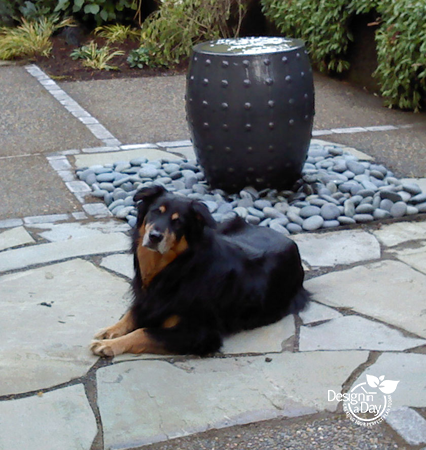 Your dog would love a water feature. Zoey, a plump black lab loves water. This frog spitter fountain is an inexpensive water feature that pleases people and the pups. It’s safe for kids because no pond. The water pump recirculates the water through the frog and is under the round rock surface safe from doggy attention. Remember to design access to the water for the dog and for kids too. If you plant all around it, expect those plants to be trampled. My client Patrick is a retired firefighter. He plumbed an old fire hydrant to use with his echo chamber. The water feature was specifically designed for his dogs to drink out of. 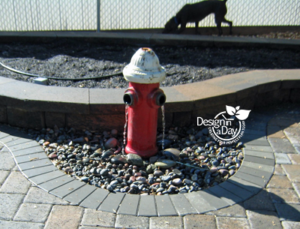 The dogs loved their fire hydrant water feature and their new back yard which had two fences running parallel at the back property line. This plant-less space between the fences was their daily race way. Standard poodles and the neighbors kids loved the big rock (Montana Mud 8′ across) water feature which was a focal point for a home in Raliegh Hills. I would find tiny little plastic toys and tennis balls tucked here and there, evidence of neighbor kids and tennis ball obsessed poodles who played in this water feature. My clients thought this was adorable and loved how this unusual water feature looked with their NW Natural style front yard. A fun water feature for two poodles. For many people, life is better with a dog and designing a happy outdoor life for two species, not just one, is what makes happiness for this designer too.